A couple of weeks ago I saw a sponsored post on Facebook that featured a scratch off map of the United States. 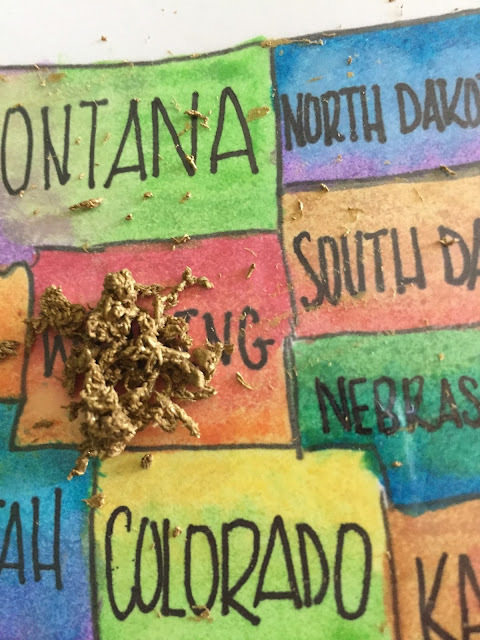 As you visit a state, you scratch off the state to reveal a pretty watercolor underneath. I was about to purchase one when I thought to myself, "I think I can make this with what I already have in my house." I watched some videos, read some blogs, and I decided to give it a try. I tried a couple different methods I found online so I could give the best recommendation and directions. I would first recommend a quick reading through the directions, because I do give many alternatives to listed materials. So even if you don't think you have or can find the supplies listed, you might have an alternative option available. 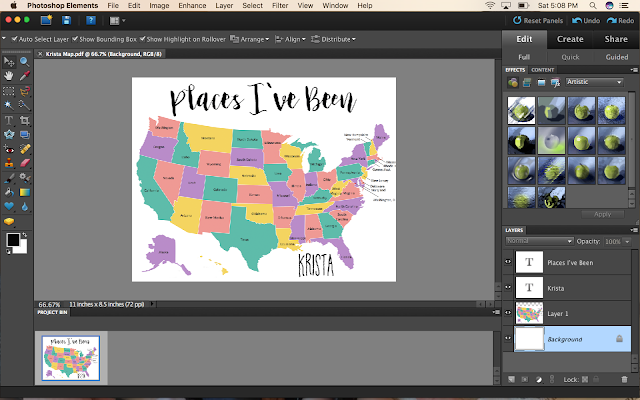 Using a simple map image, fonts I've downloaded, and Photoshop Elements, I created a mock up of what I wanted my map to look like. 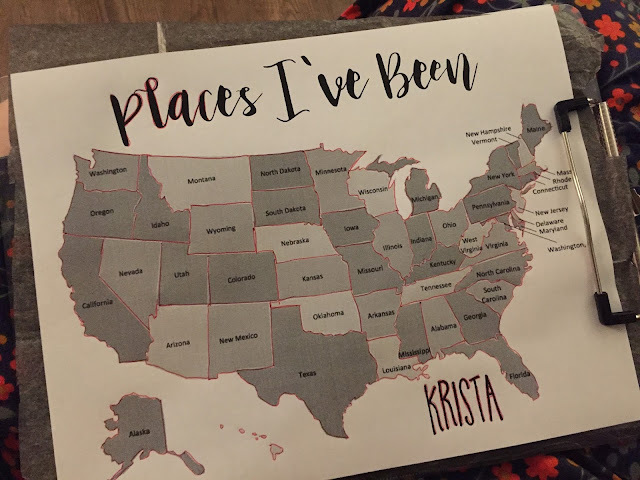 I hand lettered the state names, but you could easily add that to your mock up as well. However, there are alternatives if you don't have these resources available to you. Instead of Photoshop Elements, you could easily use Microsoft Word or Paint to create your mock up. If you don't have a computer, you could free hand draw the map right on the card stock. If you wanted to make a larger version of the map, you could also use these programs and print on several sheets and tape together. Instead of card stock, you could use foam board or poster board. Now, I thought about just printing my mock up right on to the card stock and moving on to the next step. However, the more I thought about it, I thought it was likely the watercolor would cause the printer ink to bleed. Really, graphite (i.e. pencil) would be a better option. If I wanted to get really crazy, I suppose I could have hooked up my Silhouette to draw the image with a pencil. What I did was grab some carbon transfer paper and sandwich it between a printed version of the document (on regular printer paper) and the card stock. I kept everything in place using a clipboard (but you could easily just tape everything down to the table or desk). I just traced the image with a ball point pen, and it transferred the image over. If you don't have carbon paper (it's inexpensive, reuseable, and available at craft stores), you could also try using your laptop as a light box, pushing hard enough to make an indent in the card stock or even just trying to print straight on the card stock. I'm no artist, but blending two colors is something I can do. I did each state separately. To blend the colors, I would start on one end of the state so the color was bright and then lightly move towards the center. I would then clean my brush in some water and blend the other color from the opposite side towards the center. Sometimes the colors would mix on their own beautifully. Other times I had to add a bit of water or dab up excess water with a paper towel. I worked around the entire map until each state was painted. After the map was all painted, I waited for it to dry. If you happen to have a mistake (I had a couple), you can clean it up with some White Out or even try to wipe it away with a clean damp paper towel. Since the card stock is heavier, the watercolors shouldn't bleed through or distort the paper. Once the paper is dry, you can color in the lettering with a Sharpie. 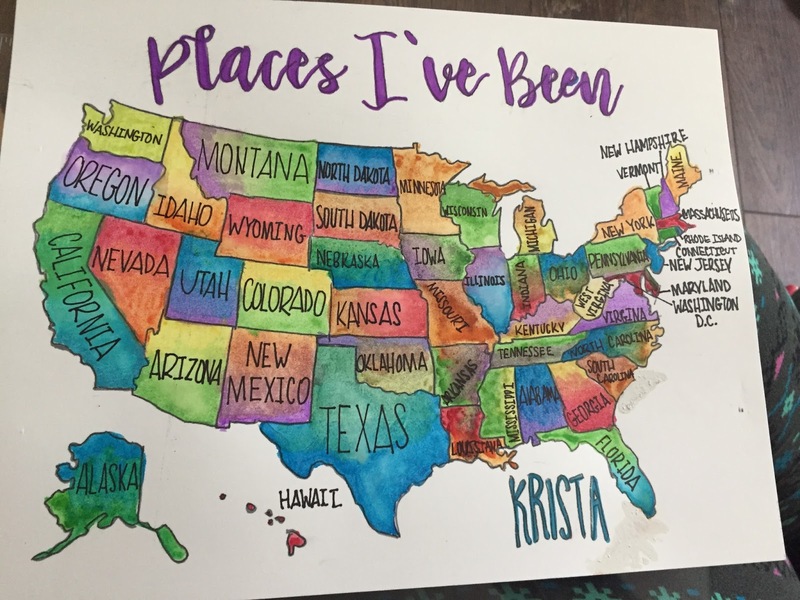 I also took the Sharpie marker and traced the outline of all the states. I then added the names of each state with a Sharpie. After I was done with all the painting and was satisfied with my map, I needed to laminate the paper. I have a heat laminator, so I simply put the map through my machine to laminate it. You can use many different methods to laminate the paper. You could use contact paper that's clear, self adhesive laminating sheets, or even packing tape. So this is where I did some experimentation. I found many tutorials online that suggested using acrylic paint in a 3 to 1 ratio with dish soap. So, I thought I would try that out with some paint I had sitting around. I wasn't overly impressed with the result. The paint wasn't smooth. Perhaps I was just too impatient and the paint wasn't quite dry yet or maybe I had the wrong type of paint, but it didn't scratch off so much as rolled off in big sticky bunches. The left behind paint was a wreck as well. I tried a paint pen, but it didn't have that soap addition so it didn't work well either. However, the paint option did allow me to put on multiple layers. With each layer, the top layer got less and less opaque. I decided not to get too caught up in staying within the lines since 1) it was a pain and, 2) it was fairly easy to scratch off where I went outside the lines. I found a blog that suggested using a chalk marker as the top layer, so I tried that as well. The chalk marker worked fantastic. It's not as solid as the paint and it scratches off easily enough that you can't add a second layer. However, I actually liked that it wasn't as solid so you could see where the states were underneath. I also liked that if I made a mistake and scratched off something I didn't mean to, I could easily go back and recolor in that section with the marker. The gold chalk marker isn't quite as metallic looking. Since it's chalk, it's matte finish. If you chose, the final step is to put the map in a frame. A document frame works well since the card stock is the same dimensions as most certificates. 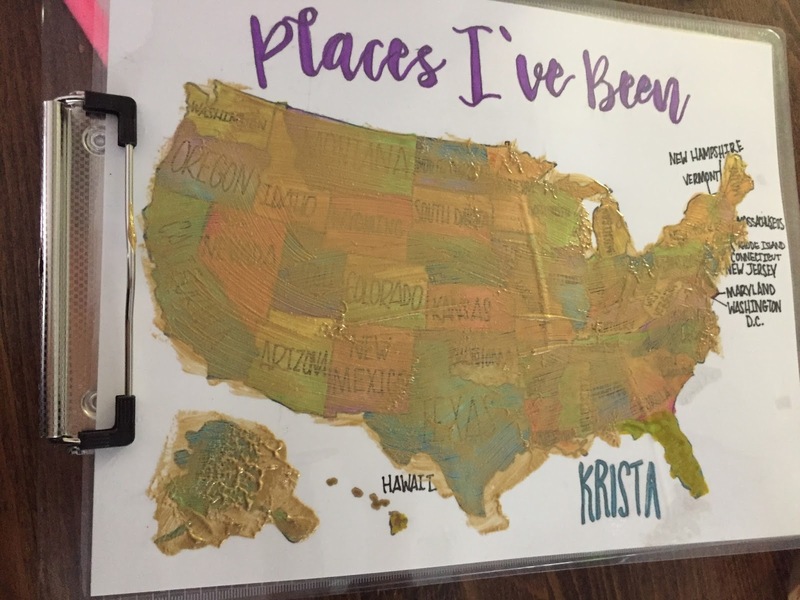 Take the glass out of the frame so you can scratch off states as you visit them. I hope this tutorial worked for you, and please let me know if you have any questions or comments below! A couple of weeks ago I tried my hand at my first Journey in a Day. It was quite the learning experience as a new troop leader, but I think over-all it went well. I found it difficult to find information beyond the "Making Friends" kit that many use, so I thought a blog post might help other troops out there who are looking into completing the Daisy journey "Three Cheers for Animals" in just one day. To give you an idea of how I came to this schedule and activities, I'm going to explain the process I followed. I found it worked well for me and will probably do something similar in the future. First of all, I went ahead and bought the leader guide for the Three Cheers for Animals journey. I wanted to get an idea of what the requirements are, look for activity ideas and see what the traditional journey plan would look like. I decided early on that I didn't want the journey to have to much coloring. I had found that the kits available to purchase had mostly coloring and not enough movement. Not to diss coloring. I love to color. However, if I wanted a group of 6 and 7 year olds to be engaged for hours I didn't think coloring was going to do the trick. I also decided early on that instead of focusing on domestic animals, I was going to focus my journey on local wildlife. This was actually a hard decision for me because my husband is a veterinarian, and I could have used him...I mean use his "expertise". However, after looking at badges to come in Brownies and Juniors, I decided there was going to be enough pet focused activities that it made sense to focus this journey to something different. To get on my soapbox for a second, my personal mission with my troop is get them engaged in the outdoors as much as possible. My personal experience when I was a scout was when our troop was more engaged in outdoor activities and education, I got more out of the scouting experience. The results of my completely unscientific survey of all my friends who were Girl Scouts as kids was they all lost interest in scouting once they ended up in a troop that only did more home based activities. I had one friend that point blank that said as a little girl she was quite peeved when she learned what her male friends were doing in Boy Scouts compared to what she was doing in Girl Scouts. So, my personal mission is to give my girls a well rounded experience. Sure, we'll do crafts. Obviously, judging by the title of my blog, I love crafts. However, I think it's important to also give them exposure to the outdoors (and STEM and leadership for that matter). It's entirely possible some of these girls come from families that aren't able to offer those kind of experiences due to a multitude of factors. While I do camp, I'm still going to have to step out of my own comfort zone as well and learn some new skills to pass along. I think that's an important part of my journey as a scout leader. Just my two cents. Back to my planning process. After I had a focus and did a preliminary read of the guide, I wrote down the different awards associated with the journey. In the Three Cheers for Animal Journey there is the Bird Bath Award, Red Robin Award and Tula Award. I then wrote down what the ultimate goal of each of these awards was. I read through the sample plans in the leader guide for each of these awards and noted what activities and stories I wanted to use in the journey. Once I did that, I then looked to see where I needed to add more content/activities. I took into account that I didn't want the girls getting all hyped up with three high energy activities in a row. So I tried to balance activities that got the girls up and moving with more passive activities. I also wrote down what the goal for each activity was. I found this helpful when I needed to keep the girls on message. I found this a fairly effective way to draft up my plan for the Journey. However, I knew from the start I was going to have trouble with timing. I have found through Girl Scout events and birthday parties, I don't really have any idea how long activities are going to take. It's hard to know with younger girls how long the attention span will hold before you need to shift direction. So, since every group of girls is different and you'll have to account for that, I would suggest having some back-up activities in case you speed through activities like we did. On the converse, maybe your group is really into one activity and wants to take more time on it. I would make note of what activities you can skip if you're running behind time wise. One other note. we did have some Brownies that decided to join the Journey. Since they didn't need or had already earned the Daisy Journey badge, I looked through current Brownie badges. I didn't find a current badge that matched what we were doing. I could have done a fun badge instead, but I felt like the girls were doing a ton of work not to earn an official badge. So, I did a bit of research and found the requirements of the retired Brownie Animal Try-It badge. One little known fact is that girls can earn the retired badges and display them with their other official badges so long as they meet the badge requirements. Many local libraries and online libraries have the old badge requirement books. So, I tracked down two retired badges on eBay and ordered them for the Brownies. Preparation: Print pictures of local wildlife and paste on notecards. Directions: Put notecards in a sack/hat. Girls take turns giving hints about the animal and the other girls try to guess what the animal is. Welcome girls to the journey. Explain that a journey is a trip. We’re going to take a journey where we learn about local wildlife/animals, how to take care of them then teach other people how to take care of wildlife. We’re going to finish up our journey will making some things to help care for wildlife in area. Goal: Give girls an overview of how taking care of our environment helps take care of local wildlife and also ourselves. Goal: Girls take the information they have received from the guest speaker and the animal guessing game to make good choices to care for local wildlife. Directions: Read the scenarios and girls give answers on what they would do. Goal: Through movement and discussion focus on how each girl is unique just like each animal. Directions: Each girl takes 3 streamers in each hand as their “wings,” Play music while each girl tries to fly around. Call out other birds to have girls act them out (Penguin, Hummingbird, blue bird, eagle, pheasant, ostrich, goose, and Flamingo). After dancing, have girls sit down to rest and have a discussion about what makes each bird special and what makes them special. Ask how they learned/got that characteristic that made them special. Goal: Girls learn about how wildlife take care of themselves and what we can do to help them. Goal: Girls create books to share with community how to help local wildlife. Allow girls to lead the discussion on where to donate the finished books. Explain how we’re going to use the whisks to pack with nest stuff and how they can hang it up at home in a tree. Goal: Girls work as a team to make a bat box for local bats. Discussion on why bat boxes are needed and relate it to the needs of each girls. The first activity we did was the Animal Guessing Game. It's a pretty basic concept. You have pictures of local wildlife, and the girls have to act out the animal while the other girls guess. Some local wildlife is easy to guess like rabbits or skunks, but surprisingly, the girls even got some of the harder ones like badgers and weasels. I found a great handout from the South Dakota Department of Game, Fish and Parks which had a list of all types of local wildlife. I found corresponding pictures and printed them out. I would recommend pictures over names since some girls probably aren't the strongest readers yet or a picture is easier for them to identify. Once the girls guessed the animal I read a couple of facts from the handout I found. After this activity, we had a professor from our local university come and speak about how to take care of local wildlife. She spoke about maintaining habitat and sustainable practices. She was really great with the girls, and they seemed genuinely interested. I took notes during her speech and came up with some quick scenerios to ask the girls to give solutions on. We had a quick snack while I read the story about the red robin and flower garden flowers telling how they got their colors. After the story we did the Fly, Fly Away game found in the leader manual. This was a favorite in the group probably because it involved moving and music. After we watched these videos, the girls had to take what they learned on the videos to make one page of a book. The book was supposed to inform the reader about local wildlife. I found a printable book page where there's a portion for a drawing at the top and then a lined book page at the bottom. There was a small amount of discussion about where we should donate the book for people to read. Eventually it was decided that we would donate the book to the local doctor's office for kids to read. After the journey I compiled all the pages into a book, laminated it, added a cover and donated it to our local doctor's office for other children to enjoy in the exam rooms. We did watch one video regarding how birds make nests which helped us with our next activity. The girls made nesting material hangers. I did a bit of research on these before we made them. I've seen them all over Pinterest, and I wanted to make sure they were actually safe for bird before we made them. The Cornell website was very helpful with what is good to put into the nesting material hangers. Dryer lint is a no go. It dissolves in the rain and therefore harms nests instead of helping them. It's no shock that natural materials are better. I did use a bit of yarn (that was a mixed recommendation on several different websites I visited). I made sure each piece of yarn was cut very short..less than 2 inches to keep it from tangling in the feet of birds. Rather than use suet cages (which can get expensive for a large group), we used dollar store whisks. They actually worked pretty well once the girls got the hang of how to pack everything in. This was one item the girls got to take home with them. The final activity was the big one and probably took up the most prep time. The girls got into teams of two or three and made bat boxes. Instead of bog this post down with all the details of how to make them, I did a separate blog post. You can check that out here. I pre-drilled all the holes so the girls could build them easier. The girls had a blast hammering at them. Prior to handing out hammers, I did remind each girl about how to properly hammer, and all the girls did a great job with small taps on the nail head. I had several small person hammers (how I have five of them I do not know) so they didn't have to worry about the weight or the huge claw on one end. After the Journey, I did take their boxes home and give them a bit of TLC before donating them to a local nature park. Since we were running about an hour ahead of schedule, we took the opportunity to get outside and do some geocaching. We held our journey at a great local resource, a large nature park. I was actually surprised by how much the girls loved it. My own daughter has asked to go several times since. That's the story of how we put the entire Daisy Three Cheers for Animals journey in one (long) day! A couple of weeks ago I organized a Daisy Journey in a Day for our local Daisies and Brownies. I'll have a full post on that experience here in a few days, but one aspect of the project that deserves it's own long winded explanation is how we built 4 bat boxes with 6 and 7 year olds. 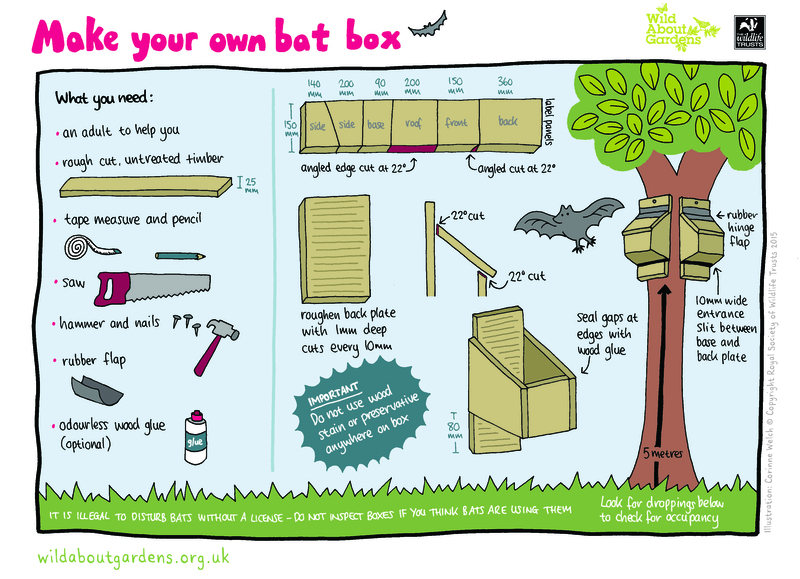 First of all, I used this handout from Wild About Gardens as the guide for building the bat houses. One caveat is the measurements are in metric. I decided not to convert them and just grabbed an old fashioned meter stick and ruler. You will want to print off the handout to get your supply list and cut list. While I bought all the supplies at once, I didn't make all the houses at once. I wanted to cut and make one sample one before I started cutting boards for the other boxes. Couple things about the supplies. You will want to make sure the wood is not treated. Treated wood has all sorts of chemicals that wouldn't be good for bats. Also, before you search the entire store, the rubber flaps you need for the hinge are in the plumbing section. You could use a nail gun if you're doing this for personal use. Otherwise you will want to pick up some nails. You will see I used huge roofing nails which aren't the ideal type of nails. This was a conscious decision since the large head on the nails would be easier for the young girls to hit. Also, I did bring wood glue, some small bowls and a bunch of q-tips and had the girls glue each piece before nailing it together. I made all the cuts for the first sample box. If you're making extras for little kids to build, you will want to take a moment between attaching all the different pieces to measure and record where the nails are going in. That way you can predrill all the holes on the other bat houses. If you have older girls, you can skip this step because they don't need to be predrilled. Also, if you plan on painting the outside of the box, it might be easier to paint the pieces prior to building the box. I painted all the pieces that would be facing out but left the inside a natural wood. I used black since the color adds extra heat. First step: Attach the front piece to the side pieces. The front piece will sit inside the side pieces. Please see the handout or pictures for examples. The side pieces and front piece will slant towards the front. Second step: Attach the bottom piece to the bat house. This piece will also be set inside the side pieces. It will sit flush with the front piece leaving a 10 cm gap in the back for the bats to enter the bat house. Third step: You need to rough up the back piece. I did this by using a sharp nail and pressure. Then attach the bat house to the back piece. Last step: Attach the rubber flap to the top piece. The angled portion will go towards the back. Then attach the top to the back piece. Ta-Da! You have a wonderful bat box to make the local insect eaters happy. Mount the bat box at least 10 feet from the ground in a sun location facing east or south. Bats are happiest when there's at least 6-8 hours of direct sunlight. Hubby is out on a calving call and the kiddos are finally asleep. I figured it was a good time to blog about the super fun Junk Jam that was held in Brookings, South Dakota yesterday. I did a review of Junk Jam last year (Click here for the post), and this year's event was even better. The event is hosted and organized by Funky Junk in Brookings, South Dakota. There was many (many) more vendors with unique items either handmade or curated. The addition of the food trucks was particularly nice as well. I had to take in the event while my oldest was at a birthday party, while Sweet Cheeks was strapped to me, so it was a rush and crazy but still a blast. Sweet Cheeks pretty much has this look the entire time. Rather than try to show you all the vendors (there was just too many great ones), I'm going to show off the pieces I picked up from some of my favorite vendors. I didn't get any furniture simply because I have no room in my house. That's part of the reason you haven't seen any furniture upcycling posts lately. There's no room in our house for upcycling. Maybe I should sell everything off so I can start over. If I didn't think my husband would lose his mind, that actually sounds like fun. The second item I picked up is one of my favorites. I think it's a planter (?). It's a hot air balloon that spins with the wind. I'm so freaking excited to find somewhere to hang it. Right now it's just in a tree with like 5 bird feeders waiting for a new home some where else in the yard. The hot air balloon came from Rustic Designs in Mitchell, South Dakota. The third item are these magnets from a vendor called Honey B Design Co. The star of their booth, however, were these AMAZING screwdriver flowers. I'm so in love with them. They were a bit outside my budget this year, but I'll have to plan on them for next year because they are just so colorful and clever. The fourth booth I loved was Rock Me Mama from Astoria, South Dakota. Well, it would be obvious for anyone who was there why I was drawn to their booth. They have a traveling boutique in a vintage Shasta camper. Uh, love! Myrtle the Aluminum Turtle would totally be jealous of their aqua paint job. I left with this cute teething necklace. Sweet Cheeks has already put it through a workout, and I love how cute it looks when I wear them...not so obviously teething related. They also have some serious adorable kids clothes. All in all, it's a great show that is totally worth the cover charge (and probably the early bird one at that...if only I could have made it!) Did you attend? Share your finds on my Facebook page!